On Tuesday, we featured the 141st challenge to see how well you know the Metro system. Here are the answers. How'd you do? This week, we got 21 guesses. Eight of you got all five. Great work Peter K, Patrick B, The Good Doctor, ArlFfx, Jay H, Hugh, MtPDC, and J-Train-21! The first image shows a view looking under the platform at King Street. The southern mezzanine is just out of frame to the left, and King Street itself is visible in the background. Figuring this one out was fairly easy, since most of you got it. The parallel railroad overpass and the stairway descending from the platform were both fairly distincitve clues. Nineteen of you knew this one. Vienna is our next image. This view is looking toward the station from the north parking garage. The lanes of westbound I-66 are visible in the foreground. 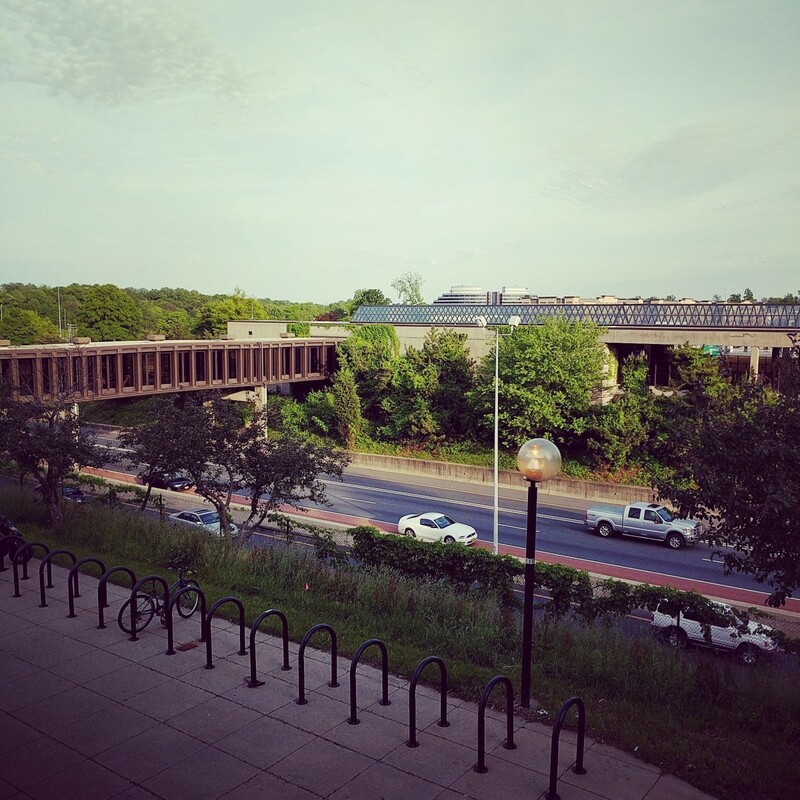 Combined with the concrete construction, you should have been able to narrow this down to one of the four Orange Line stations located in the median of the I-66 freeway. You can narrow this down by process of elimination. East Falls Church is accessed from underneath the freeway and the station platform, so it doesn't have a bridge like the one visible here. West Falls Church does have a bridge, but it crosses to the south side of I-66, and viewed from the parking garage, this image would need to be mirrored to work here. Additionally, because the station has three tracks and two platforms, it has a double row of peaked skylights, whereas there's only one visible here. 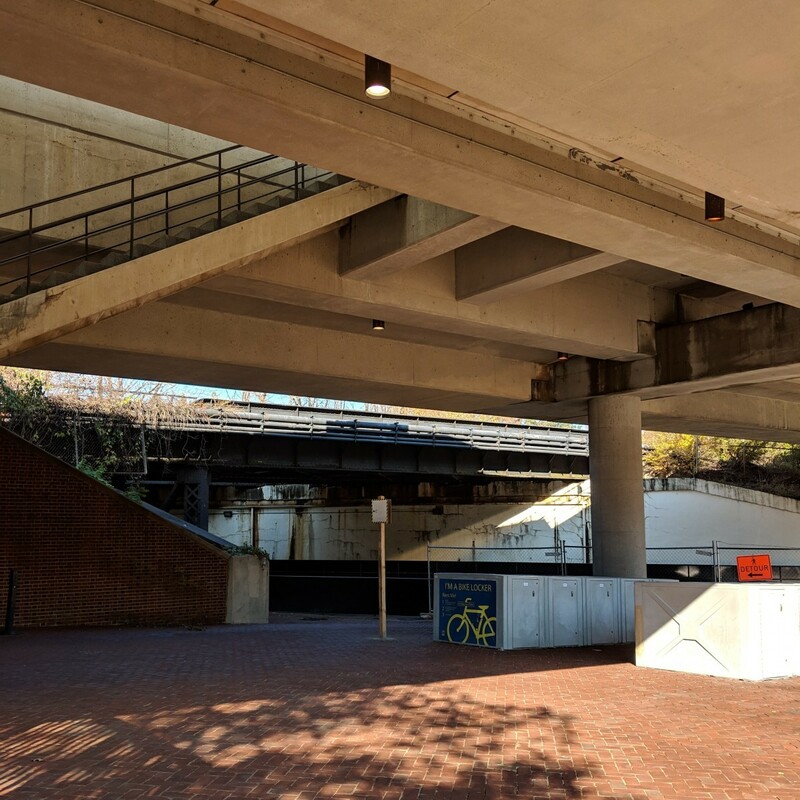 Dunn Loring doesn't fit because the mezzanine canopy slopes directly downward after fare control to avoid the Gallows Road bridge. Nineteen of you got this one right. The third picture shows a view looking south from the platform at Tysons Corner. The distinctive Vita building is visible in the background across Route 123 (and the name is actually visible on the building at far left). If you hadn't narrowed it down already, the "To W" which is visibile indicates that the platform behind me is the track for trains "To Whiehle - Reston East." Eighteen of you figured this one out. 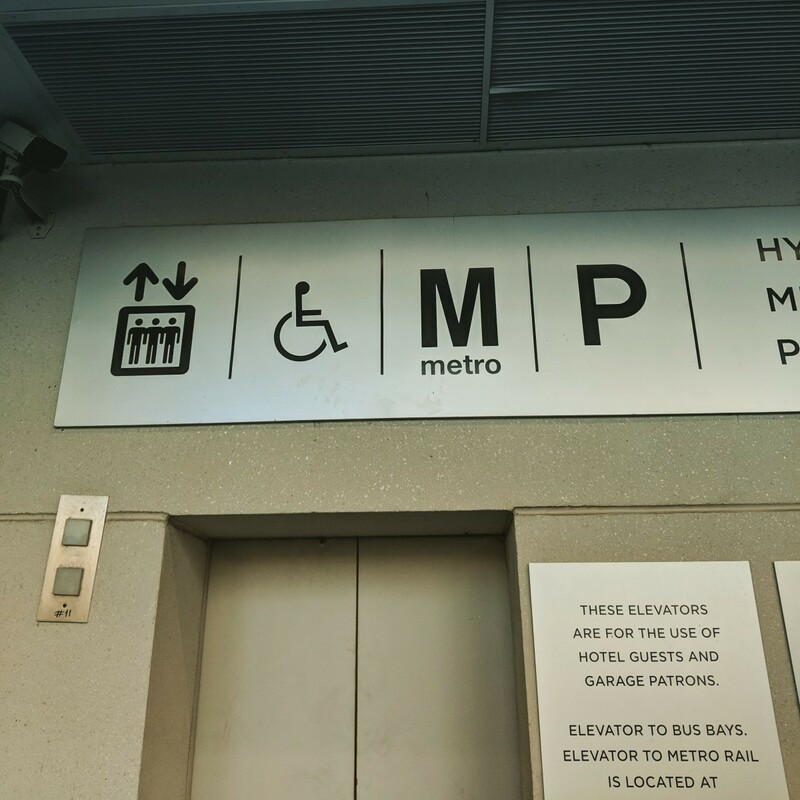 The fourth image shows a view of the elevators leading from the Bethesda Metro Center plaza down to the bus loop and main station entry at Bethesda station. The Bethesda station setup is confusing for anyone who needs to use an elevator. The station is located about 200 feet below the surface. From the mezzanine, an elevator ascends directly up to the corner of Wisconsin Avenue and Montgomery Lane, a block south of this location. The escalators from the mezzanine emerge one level below the street at the bus loop. From here, riders have four options. Directly ahead, they can use a short stair/escalator up to the southwest corner of Wisconsin Avenue and Old Georgetown Road. To the right, a tunnel leads under Wisconsin Avenue to the southeast corner. To the left is the bus loop, and pedestrian access to Edgemoor Lane and Woodmont Avenue. And just west of the escalator landing at the bus loop is a pair of elevators that leads up to street level in the Bethesda Metro Center plaza (pictured here from the plaza level). That means that if you are in a wheelchair or otherwise need an elevator and you want to connect from rail to bus at Bethesda, you first ride the main elevator up to the corner of Wisconsin and Montgomery, travel one block north on Wisconsin Avenue and turn into the plaza just beyond the Bethesda Hyatt, and then ride the elevator from the plaza down to the bus loop. Based on the comments, several of you figured out that the "HY" visible on the sign referenced a Hyatt hotel. Figuring out which Hyatt was the challenge if you weren't already familiar with this setup. There aren't too many, though there is a Hyatt at Metro Center (which doesn't have a bus loop) and one near Rosslyn. Eleven of you guessed correctly. The final image shows a view looking eastward down the tunnel at Clarendon station. Using the process of elimination, you should've been able to get to the correct answer. This is one of 18 side platform stations in the Metro system. Only 13 of those stations are underground. Since we can see the PIDS sign announcing Vienna and Wiehle trains, we can eliminate the stations that don't serve the Orange and Silver Lines, narrowing the list down to a managable eight stations. 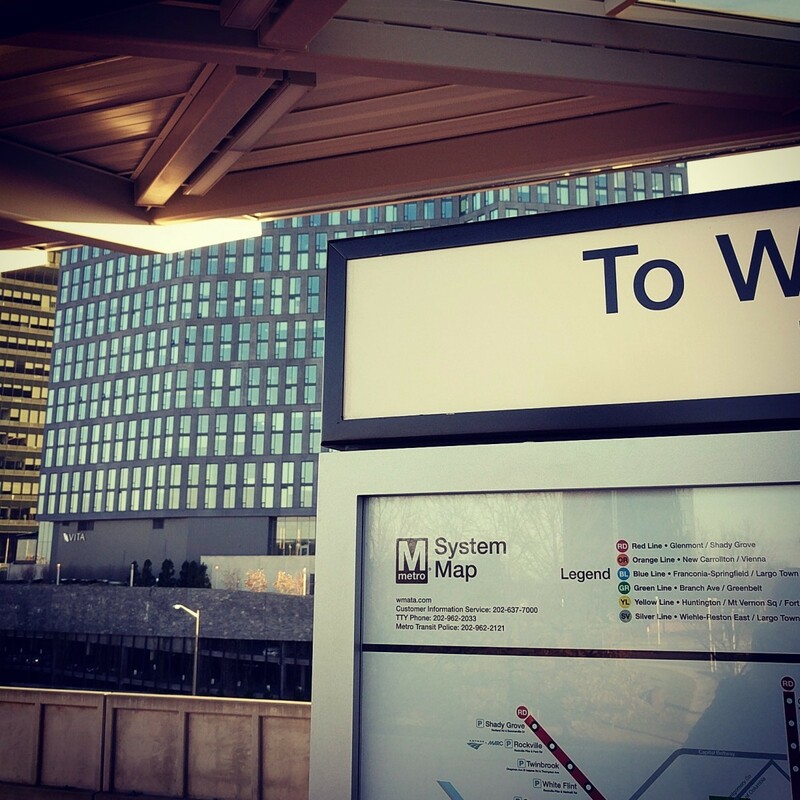 We can throw out Metro Center and L'Enfant Plaza, since the Orange and Silver lines call there on the lower island platform. Ballston, Farragut West, McPherson Square, and Smithsonian can all be eliminated because they have mezzanines at the very end of the trainroom. Since we can see the end wall here, and also see from the escalator that a mezzanine is above the picture, it can't be any of those stations. That leaves two: Clarendon and Virginia Square. Virginia Square is out because it is not adjacent to an interlocking, and so the red signal at the end of the platform (and the interlocking itself) disqualify it. If we hadn't already disqualified Ballston, it would've been a good candidate, since it also has an adjacent interlocking. But if this were Ballston, the mezzanine would be directly over the tracks at the tunnel portal, rather than in the center of the trainroom as it is at Clarendon. Fifteen of you came to the correct conclusion. Great work, everyone. Thanks for playing! We'll be back in two weeks with challenge #142. 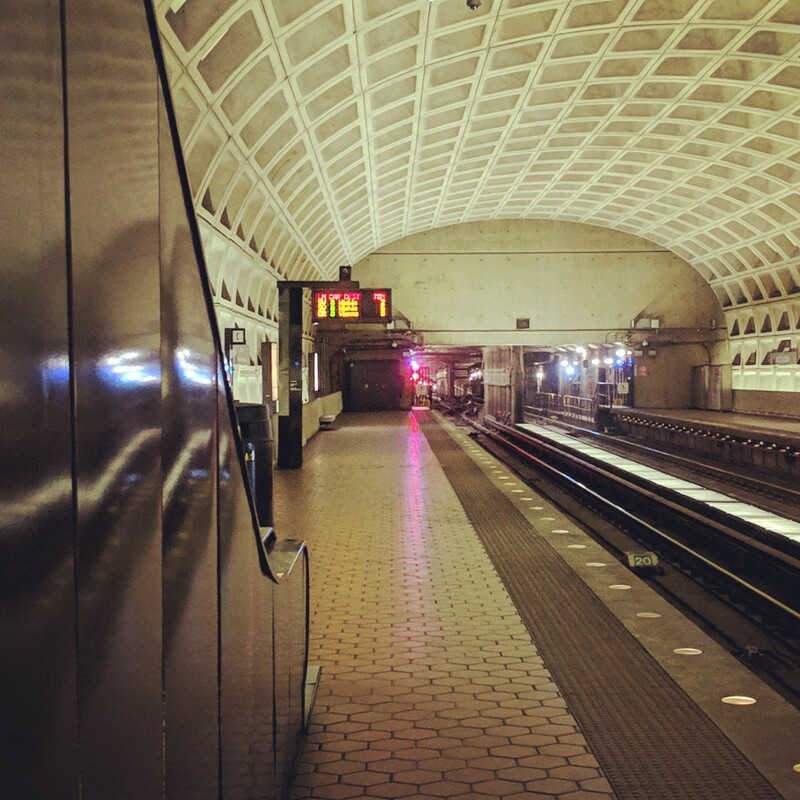 As a reminder, whichWMATA will be going on break during May.